Ah, Memorial Day Weekend! Here’s a huge list of 110 Memorial Day Beauty Sales to indulge! Sephora and Sephora.ca (NEW) Buy either three Sephora Collection eye masks or three face masks and receive the fourth free online and in stores. (1d) Sephora Memorial Day Sale up to 60% off. (NEW) Sephora Play subscribers can use code PLAY2YEARS to get 50 points with any $20 purchase. There are new items in the SEPHORA Rewards Bazaar, you can use Sephora points to redeem for free. Pick three free samples with any purchase (no minimum) here. See Sale page here. See Sephora Weekly Wow Deals. See all available kits at Sephora Favorites. Ulta (NEW) Hot buys: 50% off Urban Decay, It Cosmetics, and more. (NEW) FREE 32 Pc Beauty Bag with any $175 online purchase. One per customer. Offer valid 5/25/18 or while quanitites last. (5d) Receive a free Pureology Deluxe Hydrate Superfood Treatment Hair Mask with any purchase. (6d) FREE 8 Pc Gift w/any $16.50 Ulta Beauty Collection makeup, brushes & beauty tools purchase. Receive 20% off one qualifying item use coupon 650805 (exclude prestige brands) – printable version coupon here, ends 6/2. Through 6/2, they are running Ulta Gorgeous Hair Event 2018 at ulta.com/gorgeoushair. Shop daily steals, daily GWP and more on haircare and tools. Diamond and platinum members get free shipping on any $10 Beauty steals purchase. Free People (NEW)(HOT) Receive an exclusive Corkcicle travel mug and a Moon Juice sachet with any $200 purchase that includes a beauty item. Free Shipping Over $100 to US, CA, and AU! $150+ to all other countries! Julep (NEW)(HOT) offers 10 for $20 mystery grab bag. (NEW) They run up to 75% off and free 3pc gift on any $40 purchase use code BIGDEAL ($48 value). June Jacobs (NEW)(HOT) Receive a FREE Utra-Lite Citrus Moisturizer with any purchase, a $60.00 value! (NEW) 25% off entire site from now until June 4th. Free shipping on any $100 purchase and free samples on any purchase. Sign up to their email and receive 15% off. See Travel Size Shop here. Birchbox (NEW)(HOT)(RARE) Free beauty set with qualifying purchase of $35+ of full-size products from the Birchbox Shop. Use code: GET3. Free beauty set with qualifying purchase of $50+ of full-size products from the Birchbox Shop. Use code: GET5. Free beauty set with qualifying purchase of $75+ of full-size products from the Birchbox Shop. Use code: GET7. (NEW) Get 20% off charcoal-based products use code GRILL20. See all coupons for free gifts with purchase from the Birchbox Bonus Shop and add a FREE mystery sample pack with any full size $35 products order. Charlotte Tilbury (NEW) MAGIC MYSTERY BOX SPRING 2018 EDITION $132 – a $200 value. This Magic Mystery Box is filled with 5 FULL-SIZE best-selling makeup and skincare MAGIC, perfect for the summer months! Get it while stocks last, for a glowing look you can wear from dusk ‘till dawn. (NEW) Receive a free 2 deluxe gift with any $125 purchaese. (NEW) Enjoy a complimentary sample of Scent Of A Dream with every order on CharlotteTilbury.com! (NEW) Choose 2 complimentary samples of your choice with every order. Free shipping on any order – no minimum. Laneige (NEW) offers 30% off all makeup. (NEW) Kick off the summer with an on-the-go Hydration Kit! Yours with any $75 purchase. Select 3 complimentary samples with your order. Free Shipping on all orders over $35. Pur Cosmetics (NEW) PUR Cosmetics Memorial Day Sale! 50% Off Site-wide + Free Shipping on orders $50+! (3d) Pur Cosmetics Mystery Bag $100 VALUE – for only $20 contains 5 full size products. (3d) Receive a free Fully Charged Mascara Mini with any order no code needed. (3d) Save 25% Off orders $80+ with Free Shipping using code PUR25OFF80. SkinStore (NEW) Enjoy 25% off all your favorite brands including Epionce, Paula’s Choice and Sunday Riley use code EMAILVIP. (NEW) Enjoy 20% off! Use code: MEMORIAL Get a free FOREO LUNA play ($42 value) when you spend $150. QVC (NEW) QVC Beauty Sandra’s Favorites 6-Piece Collection $19.50 +S&H: $3. Revolve (NEW)(VERY HOT) International Sale: 20% off Entire Purchase SITEWIDE with code ITSNBD at checkout! This promotion ends on June 1, 2018 at 1:59AM PST. Coupon can be only used for shipments to China, Hong Kong, Macao, Taiwan, South Korea, Japan, Singapore, Kuwait, Oman, Pakistan, Saudi Arabia, United Arab Emirates, Bahrain, Cyprus, India, Israel, Jordan, Malaysia In addition to this sale, REVOLVE will now be offering FREE Shipping & returns for international orders as well! REVOLVE Beauty x Tash Oakley Natural Beauty Box $175. $424 retail value. REVOLVE x LPA Beauty and the Booze Box $150. $332 retail value. Revolove is offering so many Revolve limited edition beauty boxes. Space NK US Through 5/27 N.Dulge Exclusive. Reach Your Rewards Faster With Double Points. 100 Points = $5 N.Centive. Visit gift with purchase offers at Space NK here. Choose 3 free samples at checkout. Free shipping on any $50 purchase. Remember, you will receive $5 points every $100. Make sure you enroll to a free membership program NDulge. Sign up for free here. Free shipping on any $50 order. Free shipping with ShopRunner. Adore Beauty Australia (NEW) Through 3PM AEST, get 3 free deluxe samples on any order! See this page for all coupon codes. Free shipping on all Australian orders. Two free samples on any $50 order. Ship to US, Canada, UK starts from $6.95. Algenist (NEW) offers 10% off $50 purchase use code MAY10; 20% off $100 purchase use code MAY20 or 30% off $150 purchase use code MAY30, ends 5/30. Receive free Travel GENIUS Vitamin C+ Serum with orders $100+. No code required. While supplies last. Free shipping on any $50 order and choose 3 free samples on any order. Use code SIGNMEUP to get a free FREE Travel Size Firming & Lifting Cream ($26 value) with any $75 purchase. AHAVA (NEW) Use code MEMORIAL40 to get 40% off. Choose 3 free samples at checkout. Free shipping on any $50 purchase. Amazon (NEW) 35% off Home and Furniture sale. (NEW) Plus, 40% off Dyson fan and up to 80% off Kindle book sale. (NEW) May 11, 2018, new members will be charged $119/year for an annual Prime membership and $59/year for an annual Prime Student membership. AmorePacific (NEW) 30% off all masks. (HOT) GIFT 1: Receive an Intro to Double Cleanse Kit (2pc) with every purchase. GIFT 2: Receive two deluxe samples of AMOREPACIFIC essentials with any AMOREPACIFIC Online purchase. GIFT 3: Get a Free 12 Steps of Korean Beauty ($162 Value) when You Spend $600! In addition, use code WELCOME10 to get 10% off any purchase. Free shipping on any order. Anthropologie (NEW) take an extra 25% off on all sale clothing + beauty + accessories and take an extra 40% off on sale home décor. Shop all beauty. (6d) See Beauty Sale page. ASOS US (NEW) 30 percent off of occasionwear for a limited time while supplies last. Receive a BY TERRY 4pc Mini Bundle $45 value With full-price BY TERRY orders $65+. And, 3 free samples at checkout. Banana Republic (NEW) Get 50 to 70 percent off of everything but clearance until May 29. Free shipping on any $50 purchase. BareMinerals (NEW) Limited Time only. Purchase Any Foundation and Primer Together for $45. Plus, Free Shipping! Valid 5/24-5/28. (NEW) Also, Free Shipping Sitewide. Enjoy Free Shipping on Every Order Through May 28 with Code MDW2018, ends 5/28. (NEW) Choose 3 Free Samples. Discover a New Favorite. Choose Your Own Samples with Any $60 Purchase. Valid 5/24-5/28! Enjoy a free sample of a bareMinerals product with every order you place. Free shipping on any $50 order. Barneys Warehouse (NEW) Memorial Day sale – extra 50 percent off the entire site from May 25 through May 31. Free shipping and returns all US orders. Bath & Body Works (NEW) $10 off any $30 purchase Enter code SUMMERFUN at checkout. The Bay Canada (Hudson’s Bay) (NEW) Receive a free makeup bag and beauty samples with any $75 purchase plus, with any $100 purchase get a free matching tote bag and 2000 points. GIFT 1: Choose your seven-piece gift with any $85+ Estee Lauder purchase. GIFT 2: Spend More, Get More: Receive an Advanced Night Repair and Advanced Night Repair Eye Matrix with any $125+ Estee Lauder purchase. See beauty gift with purchase at The Bay. Ship within Canada only, choose 3 free samples and free shipping with any $49 beauty purchase. BeautifiedYou (NEW) Use code MEMDAY to get 25% off. They offer seven exclusive beauty bags from $5 – $15 ($50 value) and shipping is free (international shipping adds $10). Free skincare samples with purchase. Free shipping on any $25 order. Beauty Bay UK (NEW) 20% off $70+, 25% off $110+ or 30% off $160+ no code needed. See all beauty offers here. Free tracked shipping on any $70 purchase. Beauty Brands (NEW) Use code EM15197 to get 20% off regular price items, ends 5/28. (6d)(HOT) Receive a FREE Beauty Brands 11-Piece Gift with any $50 online purchase. Over a $70 value, ends 5/22. Check out Beauty Brands Discovery Boxes. (6d) Use code EC15248 to get $3.50 off $10 purchase. Free shipping on order $50+ or add $5.95. Check out their May GWPs, see this page including nice Laura Geller kit. You can save 10% off your entire purchase when you use the code TTTEN or tt2938. Benefit Cosmetics (NEW) Free shipping on any order, ends 5/29. Choose 2 free samples with any order. BH Cosmetics (NEW) Score 35 percent off site-wide, plus a free deluxe gift on May 25 – May 31. Biossance (NEW) Free shipping all order. (NEW) Get a free 8pc gift on any $75 purchase ($45 value) use code TRAVEL. (NEW) Don’t forget that you can try 1 of 3 sets here for free ($5 shipping). Bobbi Brown Cosmetics (NEW) Memorial Day Weekend Exclusive! Pick a Free Full Size Skincare Product with your $85+ order. Pick at checkout. Valid 5/25-5/28. (NEW) 20% off on your entire purchase use CODE: THANKYOU20. Plus, choose two free samples at checkout. Free shipping on any $65 order. See 30% off Last Chance items here. The Body Shop (NEW) Buy three products and get three free, or buy two and get one free plus free shipping through May 30. Bond No. 9 (NEW) Through 6/13, Receive one complimentary perfume refill with the purchase of any two Bond No. 9 New York products (including a 100ml fragrance). Select three complimentary samples with any bondno9.com purchase, no minimum purchase required. Free samples and free shipping on any order. Bumble and Bumble (NEW) Get a 6-piece Bb.Everything Set ($52 value), plus shipping free with $35 orders. Enjoy 2 top-selling samples with $50 orders. Butter London (NEW) Use code MEM18 to get 25% off $50 or $30 off $100 purchase. TRY: Receive a free 5pc gift with $50 purchase use code BONUS50. Free shipping on any order. CARGO Cosmetics (NEW) 20% off plus free shipping with any purchase. Ciate London (NEW) Use Code SUNSHINE to redeem discount of 20% on all full-priced products, ends 5/28. (NEW) Mix and Match 3 Nail polishes for $20. Free shipping on any $75. Buxom Cosmetics (NEW) offers 15% off + free shipping use code MDAY15. < Free Deluxe Sample with Any Order. Free Standard Shipping with $25 Purchase. Clarins (NEW) Choose 6 free samples on any purchase no minimum required. Memorial Day Sale: up to 30% Off an exclusive selection of products. Plus, get 5-pc gift set (up to $115 value) with $100+ purchase, ends 5/28. Free shipping on any $75 purchase or add $5 shipping fee. ColourPop (NEW) 20% off any $50 purchase. No code needed. Ends May 28. (NEW) Receive a free limited-edition Birthday Cake Shadow with every order over $10, while supplies last. Cover FX (NEW) 20% off $50 purchase use Code: MDW18. Sign up to get 15% off your first purchase. Free shipping + 3 free samples with any $50 order. Crabtree & Evelyn (NEW) is now offering 30% Off Memorial Day Sale. Free Shipping on orders $25 or more. Credo Beauty (NEW) Get 3pc gift on any $100 puchase use code SUMMERFUN. (NEW) Free shipping all orders use code SHIPIT. Credo Clean Makeup Kit $ 59. It’s $103 worth of goodness for only $59. CheapOair (NEW) Get Away This Memorial Day! Save up to $18 off flights & hotels with promo code MEMO18. Darphin (NEW) Free Hydraskin 5-Piece Gift with $100+ Purchase! Code: HYDRA. Valid 5/26-5/31 Free shipping on any purchase. Dermstore (NEW) Use code CELEBRATE to get 20% off select brands. BeautyFIX Mother’s Day 2018 beauty box $49.95 + free shipping. See gift with purchase and sample bag offers here. See See their sale section here. Magazine Subscription or rebate (one time only See site for instruction) with select purchase. The Detox Market (NEW) Starting tonight, 15% off orders over $200 with code 15OFF. TRY: Free shipping on any order use code SHIPFREE. See all coupon code here. Dr Brandt (NEW) offers 40% off use coupon code MEMORIAL40. Shipping fee is $6.95, or free shipping on orders over $49. Eddie Bauer (NEW) is offering up a whopping 50% off EVERYTHING sitewide with promo code HONOR50 at checkout – including clearance! Free shipping on any $99 purchase or free shipping on any $25 purchase with Shoprunner. Estee Lauder (NEW) Choose a Free Deluxe Sample with every $25 spent up to $150. Add New DayWear Eye Cooling GelCreme & Perfectly Clean Cleanser/Toner/Makeup Remover with $50 purchase. Use code COOLIT. Valid 5/25-5/29. See more Estee Lauder coupons and promotions here. Plus, free sample every $25 purchase – up to 6 free samples from Estee Lauder. Plus, member will get 15% off with any purchase use coupon code “ELIST15” (free to join). Foreo (NEW) 20% off Espada use code WINEDAY. (NEW) Get 25% off LUNA 2, ISSA, ISSA Hybrid, Espada Using Code MEMDAY18. Valid 5/27 – 5/29. Free shipping no minimum use code SHIP00 or free shipping on any $50 purchase. Glamglow (NEW) Friends and Family: get 25% off plus free shipping with any purchase. (NEW) Get a free full size Sun Glowstarter Mega Illuminating Moisturizer ($49 value) on any $$75 purchase use code GGFF18, ends 6/3. Try: 15% off your purchase use code WELCOME15. Free shipping and 2 free deluxe samples (with any $24 order) at checkout. H&M (NEW) Memorial Day Sale and offers up to 60% off. It Cosmetics (NEW) Spend $45, receive a travel-sized concealer, mascara, and brow pencil trio with the code SUNSHINE, Now through 5/29. Lime Crime (NEW) offers up to 75% off sale. JCPenney (NEW) $10 Off $25 or More. Valid 5/24-5/28. Code: 10FORYOU. Kat Von D (NEW) For a limited time only! Spend $75 and get a Studded Kiss Canvas Makeup Bag, Compact Mirror and mini Studded Kiss Crème Lipsticks in “Underage Red” and “Double Dare.” Shop now through Monday! No code necessary. (NEW) I Am Divine Eyeshadow Palette – Now only $23 (Originally $38) They launhed 10-year Anniversary Collection. Free shipping on any order use code FREESHIP. Kate Somerville (NEW) GIFT 1: Receive a complimentary RetAsphere 2-in-2 Retinol Night Cream ($85 value) with any $120 purchase. Use code MDW18. Valid from 5/25-5/28. GIFT 2: Complimentary Skin Moisturizing Trio ($44 value) with any $120 purchase. No promo code required. Valid 5/1-5/31. Free shipping with any order and 3 free samples with any order. New customer offer: Receive 10% off + a complimentary travel size ExfoliKate Cleanser with any purchase. Use promo code NEWQ218. Valid thru 6/30. Free shipping with any order and 3 free samples with any order. Koh Gen Do Cosmetics (NEW) 15% off all sale products use code FINAL15. Free shipping on any $50 purchase. L’Occitane (NEW) offers 3-piece gift on any purchase plus get $10 off any $40 purchase use code HYDRATE, ends 6/10. (NEW) Use code TRAVEL to get a free 3pc gift with any $55 purchase. Free shipping on any $25 purchase. Creme de La Mer (NEW) Through 5/27, receive free deluxe sample of Genaissance de la Mer Serum Essence with any $150 purchase use code INFUSE18. Plus, select 2 samples at checkout + Free shipping. Lancer (NEW) Through 6/3, 15% off any order; Free “Glow Appeal” skincare set with any purchase of over $300. Free shipping on any $150 purchase. Lancome (NEW) Use code FRIENDS to get 20% off all orders + Free shipping all orders + free 3 deluxe skincare gift (a $121 value) with any $125 purchase. Lancome Canada (NEW) Get an exclusive FREE 6-pc gift and a Makeup pouch with orders $65+ at Lancome Canada! Use the code BEAUTY at checkout. Latest In Beauty.com (NEW) The new box is live! The Eve Appeal Box features 10 products worth £100, on sale for just £25. Plus, 10% of all sales are donated to The Eve Appeal charity. Laura Geller (NEW) 50% off all foundations and makeup primers use code MEMORIAL, ends 5/30. Lookfantastic UK (NEW)(Today Only) Save 20% on your order but be quick as it is a declining discount Use code: QUICK. (3d) ESPA x Lookfantastic beauty box £69 or $97.50 (worth over £178). Subscribers can use coupon code ESPA14 or ESPASUBS to get this box for £55. Non-sub can use use coupon code LF15 to get 15% off or CUSTOMER20 to get 20% off. Lookfantastic US, CA (NEW) Use code MDBEAUTY to get 15% off sitewide. (NEW) Get 35% off Urban Decay Vault. Lorac (NEW) offers 30% off select items. LUCKY VITAMIN (NEW) 20% OFF NO MINIMUM use Code: MEM20. 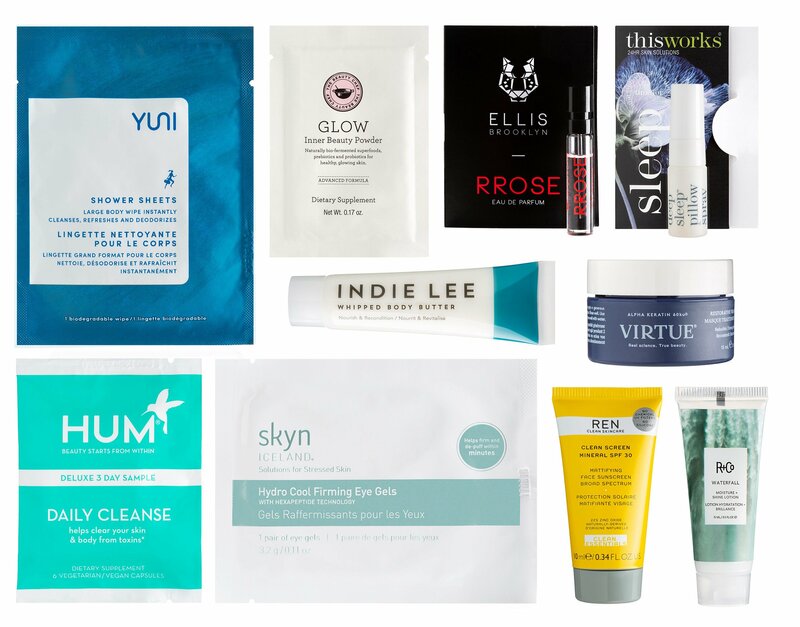 Spring Beauty Bag – 16 Piece(s) by LuckyVitamin Collections $29. No Subscription Needed! MAKE Beauty (NEW) 25% off all makeup with code MEMORIAL. Free shipping on any $25 order. Make Up For Ever (NEW) runs 20% – 50% off select items. Free shipping on any order. Malin + Goetz (NEW) Free shipping with any purchase use code GETAWAY, ends 5/28. (6d) Shop The Eucalyptus Cool Down + Free Deluxe Sample! Alternatively, use code MG2018 to get free shipping sitewide. Milani (NEW) 30% off sitewide use code MD30. (NEW) Free 2 minis with any $40 purchase. Free shipping on $25 order. MISSHA (NEW) offers new cuarted sets and 30% off gift sets. ModCloth (NEW) 15% off on purchases of $100+ use CODE: GLASS. Get 15% off your first order when you sign-up. Free shipping on any $75. (NEW) Free 3-Piece Travel Set with any purchase of $70 or more. Use Code: 70MOM. Valid until 6/2/18 (NEW) Free 6-Piece Travel Set with any purchase of $110 or more. Use Code: 110MOM. Valid until 6/2/18 Free shipping on $75 order. Murad (NEW) Get a free deluxe size City Skin Overnight Detox Moisturizer on any purchase. No code needed. Neiman Marcus Last Call (NEW) is now offering an extra 40% off everything and extra 60% off clearance. Olay (NEW) Use code SPF to get a free All Day Lotion SPF15 (first 120 only) with Olay Whips SPF25 purchase. Free shipping all orders. Ole Henriksen (NEW) Use code SUMMERLOVE to get a free 3pc deluxe gift on any $50 purchase (a $30 value). (5d) Use code TAKETHEPLUNGE to get the free mask brush. Use code FREESHIP for free shipping. OneTravel (NEW) Memorial Day Travel Deal! Save up to $18 with Promo Code MEMORY18. Origins (NEW) With any $45 purchase choose a free mini skincare trio use code BASIC, PLANT, or GINZING, ends 5/28. Ouidad (NEW) Memorial Day Liter Sale: 20% Off All Liters, Plus Free travel-size Ultra-Nourishing Oil Plus Melt Down Mask Plus ACC Detangling Spray Plus Finishing Mist with purchase of 3 or More liters – Coupon Code: TWENTYOFF! Free shipping with any $50 or adds $5.95. Paula’s Choice (NEW) 15% Off + 2 Free Gifts on $65+, plus Free Shipping on All Orders 15% Off Top-Rated Products no code needed, ends 5/9. Choose 3 free samples on any $5 order. Perricone MD (NEW) is now offering up to 50% off + a free gift with a $150 purchase use the code “GETREADY” at checkoutAll orders $50.00 or more ship for free. Peter Thomas Roth (NEW) 50% off its Super Size Instant Mineral SPF 45, a setting powder with sun protection thanks to physical blockers zinc and titanium oxide. (1d) Memorial Day Sale — Travel Size items only $2.50 and up! Free Shipping and free samples on orders over $50. TRY: Use code 15OFFPTR to get 15% off your order. Philosophy (NEW) Spend $60 online, get a complimentary cosmetics bag with 6 travel sized products through 5/28. Plus get 3 free samples with every order. Shipping is free on orders $50+. Prescriptives (NEW) 20% Off Sitewide! Excludes Custom Blend. Use Code MDAY20OFF. Valid 5/25-5/28! (NEW) Choose a free 3pc gift with any $35 purchase. Plus, Choose 6 free samples with $25+ orders! No code needed. Valid 4/23-6/30. Receive 15% Off Your First Order at Prescriptives.com. Use code: AFFWELCOME15. Valid for new customers only. , ends 12/31/2022. Always free shipping all orders. Raise (NEW) Memorial Day Sale! Extra 5% off sitewide with code HOTDOG (Ends 5/28/18). Shu Uemura (NEW) Enjoy FREE shipping on ALL eye liners + exclusive makeup pouch on orders $50+ at Shu Uemura. Use the code SHIPLINER at checkout (valid 5/24-5/27). (3d) enjoy free shipping on the Yazbukey collection! use code YAZBUKEY. Also, available at Shu Uemura Canada. Sigma Beauty (NEW) offers 25% off brushes and brush sets use code MEMORIAL25. Join their newsletter and receive $10 off your first order. Free shipping on any $50 purchase. SkinCareRx (NEW) Save 25% on: Epionce, iS Clinical, Sunday Riley, and more! Plus, receive a Replenix RetinolForte 3X Treatment Serum when you spend $100 Use Code: EMAILFAV. Skyn ICELAND (NEW) Receive 25% on ALL products. Offer is valid until May 28th. Use code 15OFFSUM to get 15% off sitewide. Use code 2DAYFREE to get a free 2-day shipping. Smashbox Cosmetics (NEW) $10 off $50 or $15 off $75 or $25 off $100 or $50 off $150, ends 5/29. Sign up and get 15% off your first order or use WELCOME15 to get 15% off. Stila Cosmetics (NEW) Use code SUNNY to get free shipping on any order, ends 5/28. (NEW) Free 3 mini lip products with $50 purchase. (NEW) They run up to 85% off. Use code 10OFFCART to get 10% off your order. Get a free sample with every order. No code needed. Tatcha (NEW) Use code AGELESS18 to get a free deluxe eye cream ($29 value) on any $100 purchase. Plus, get a free $68 value Renewal face cream on any $125 purchase. (6d) New exclusive: Lip POUT-PERFECTING PAIRS $68 ($90 value) – limit 3 per household. Receive a complimentary deluxe sample size Camellia Cleansing Oil with your first order when you join our newsletter. Tarte Cosmetics (NEW) 20% Off $50; 25% Off $75 or 30% Off $100 use code WEEKEND. Temptu (NEW) Save $10 Off Your $50 Purchase. Code: SAVE10. Time to Spa (NEW) Save $20 on Every $100 You Spend with Code: MEMORIAL, ends 5/28. 4 Free Samples With Every Order and Free Shipping on Orders $49 or More. Too Faced Cosmetics(NEW) Starting tonight, 20% Off Site Wide + FREE SHIPPING with code SUPSUMMER. Offer excludes the Clover collection, new products, and the sale section. Choose extra 2 free samples at checkout. Violet Grey (NEW) Now through May 28th, save: $15 off $100, $50 off $250, $100 off $500, and $250 off $1,000. No code required. Exclusive Dr Barbara Sturm Kids starting from $50. VIOLET GREY The Evening Bag Edit $75. See all Violet Grey Exclusive beauty boxes. W3LL People (NEW) Get a free limited edition W3LL PEOPLE water bottle 20 oz on any $55 purchase. GET 3 SAMPLES FOR $3 with any full-size purchase. Yankee Candle (NEW) is offering up to 75% off sitewide as part of their Semi-Annual Sale with prices starting as low as $1. Yesstyle (NEW) offers up to 80% off Memorial Day sale. (NEW) Get a free, limited-edition sample from The History of Whoo with select Beauty purchases worth US$ 200. ZIRH (NEW) 20% off sitewide no code needed. Free shipping with any $60 order and free deluxe sample all orders. Box of Style (NEW) Memorial Day Flash Sale: through 5/28, use code WKEND30 to get $30 off the Summer Box of Style. A great gift for any style savvy woman, Box of Style by The Zoe Report: Over $400 worth of this season’s most coveted fashion and beauty finds for just $99. YSL Beauty Canada (NEW) YSL Beauty Private Sale! Get 20% off site wide + exclusive GWP with orders $150+ only at YSL Beauty Canada. Valid 5/26-5/28 (excludes gift sets, Le Vestiaire des Parfums collection and gift wrapping). That’s my entire day work, I hope you enjoyed it!! Posts will be light during the weekend. Have a good weekend everyone! Wow, great info! Enjoy your weekend! Thanks Patricia! Enjoy your weekend!